The Saskatoon Blades and Prince Albert Raiders square off for Game 2 of their second-round series on Sunday at 8:00pm ET/5:00pm PT on Sportsnet East, Ontario, West, Pacific, and Sportsnet 360. The first-place Raiders carry a 1-0 series lead following Friday’s 6-1 victory in which centre Sean Montgomery notched a hat-trick to lead the way for his squad. Draft-eligible right-wing Brett Leason also had an impressive night as he wrapped up the series-opener with one goal and three assists, while fellow forward Parker Kelly also finished with two goals. 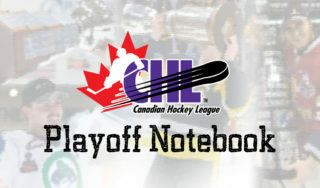 Centre Chase Wouters scored the lone goal for the Blades, who suffered their first loss of the 2019 postseason after sweeping the Moose Jaw Warriors in the quarter-final. The victory marked the Blades’ first series win since 2011, a year in which they later lost in the semi-final. 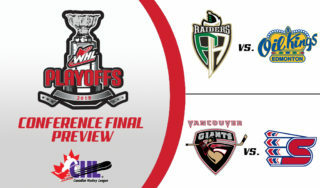 Meanwhile, the Raiders punched their ticket to this year’s second round after ousting the Red Deer Rebels in four games, marking the first time since 2005 that the club has advanced beyond the quarter-final. 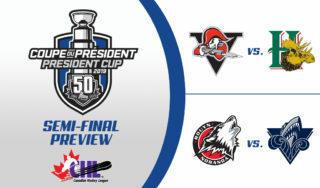 The Raiders will now look to replicate their regular-season success versus the Blades, as they took six of eight contests versus the provincial rival during the 2018-19 campaign. 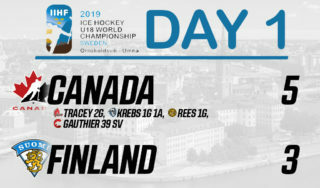 Through the early goings of the postseason, Leason is pushing the offensive pace for the Raiders, as he has recorded seven points in four games, while right-wing Max Gerlach and fellow 2019 NHL Draft hopeful Kirby Dach lead the way for the Blades with five points each. Catch all the action in Game 2 between the Blades and Raiders on Sunday at 8:00pm ET/5:00pm PT on Sportsnet East, Ontario, West, Pacific, and Sportsnet 360.